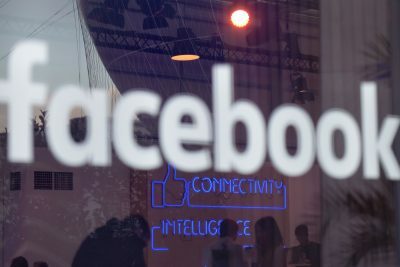 Facebook’s advertising has become a focus of national attention since it disclosed last week that it had discovered $100,000 worth of ads placed during the 2016 presidential election season by “inauthentic” accounts that appeared to be affiliated with Russia. Traditionally, tech companies have contended that it’s not their role to censor the Internet or to discourage legitimate political expression. In the wake of the violent protests in Charlottesville by right-wing groups that included self-described Nazis, Facebook and other tech companies vowed to strengthen their monitoring of hate speech. Facebook CEO Mark Zuckerberg wrote at the time that “there is no place for hate in our community,” and pledged to keep a closer eye on hateful posts and threats of violence on Facebook. “It’s a disgrace that we still need to say that neo-Nazis and white supremacists are wrong — as if this is somehow not obvious,” he wrote. 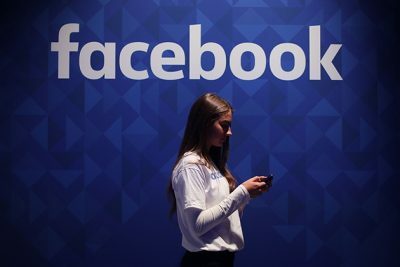 But Facebook apparently did not intensify its scrutiny of its ad buying platform. 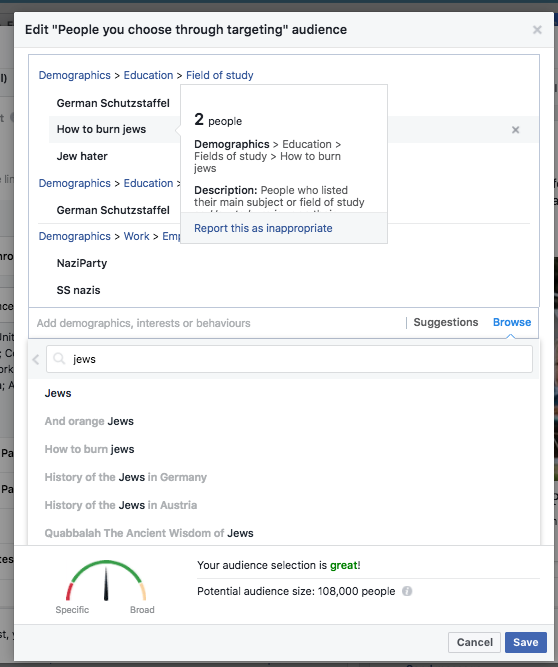 In all likelihood, the ad categories that we spotted were automatically generated because people had listed those anti-Semitic themes on their Facebook profiles as an interest, an employer or a “field of study.” Facebook’s algorithm automatically transforms people’s declared interests into advertising categories. 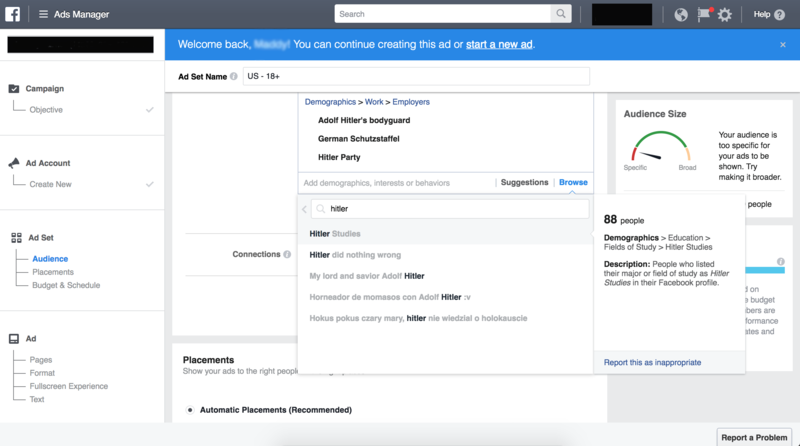 This is not the first controversy over Facebook’s ad categories. 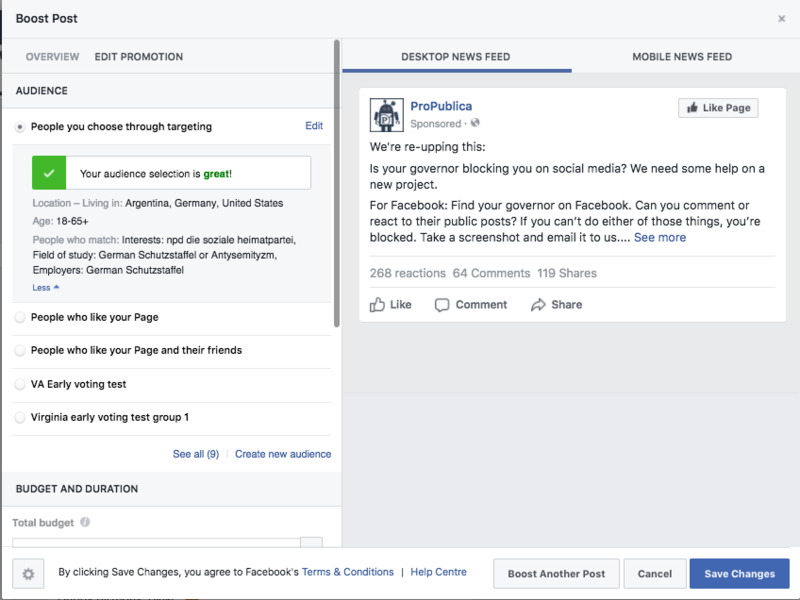 Last year, ProPublica was able to block an ad that we bought in Facebook’s housing categories from being shown to African-Americans, Hispanics and Asian-Americans, raising the question of whether such ad targeting violated laws against discrimination in housing advertising. 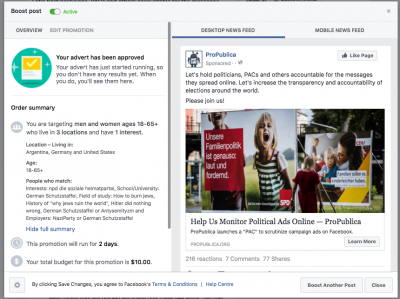 After ProPublica’s article appeared, Facebook built a system that it said would prevent such ads from being approved. 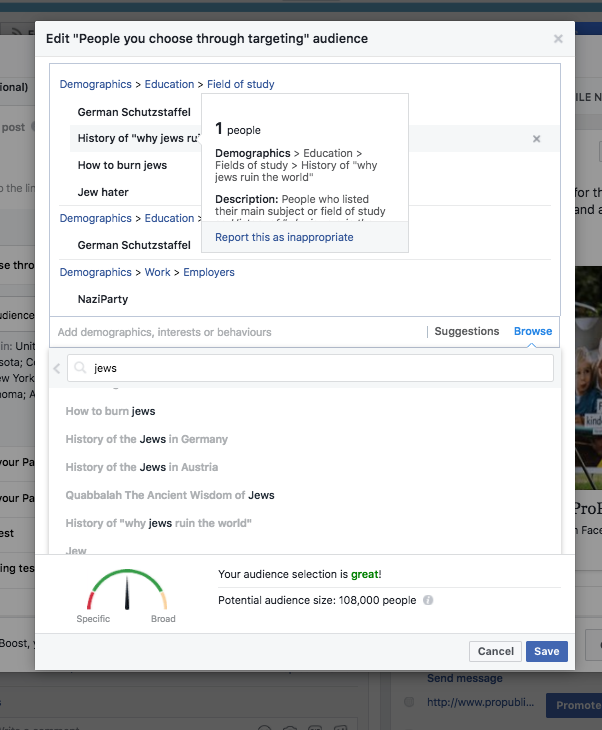 At that time, we did not find any anti-Semitic categories, but we do not know if we captured all of Facebook’s possible ad categories, or if these categories were added later. A Facebook spokesman didn’t respond to a question about when the categories were introduced. 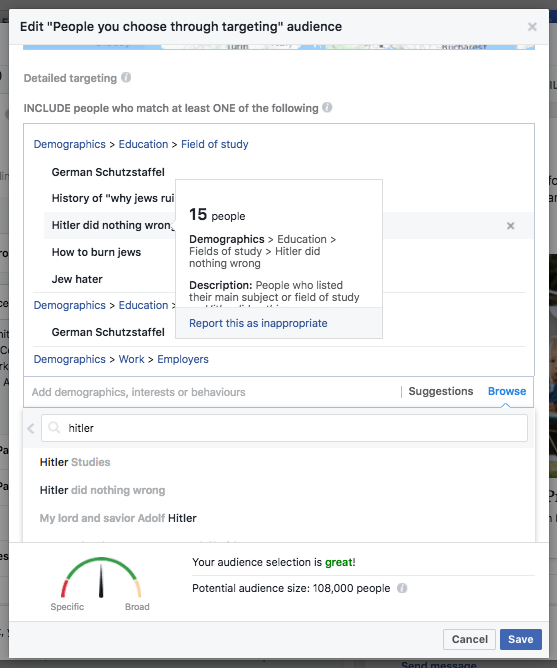 Last week, acting on a tip, we logged into Facebook’s automated ad system to see if “Jew hater” was really an ad category. 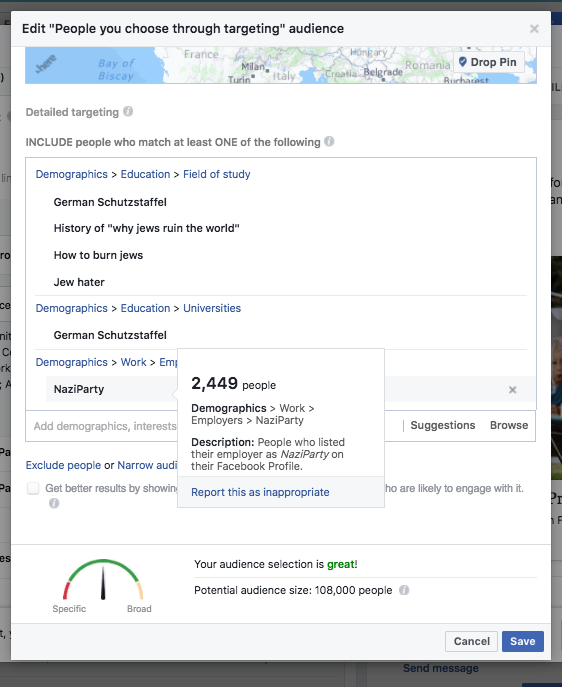 We found it, but discovered that the category — with only 2,274 people in it — was too small for Facebook to allow us to buy an ad pegged only to Jew haters. 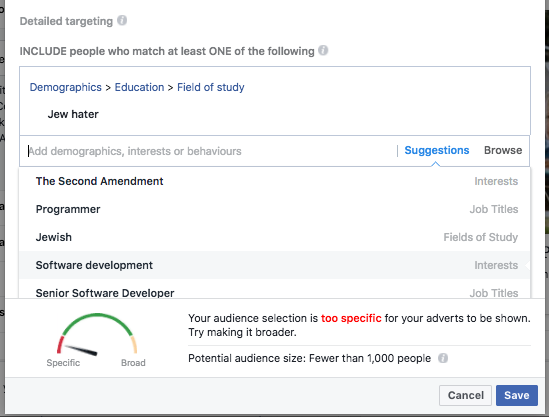 Facebook’s automated system suggested “Second Amendment” as an additional category that would boost our audience size to 119,000 people, presumably because its system had correlated gun enthusiasts with anti-Semites. 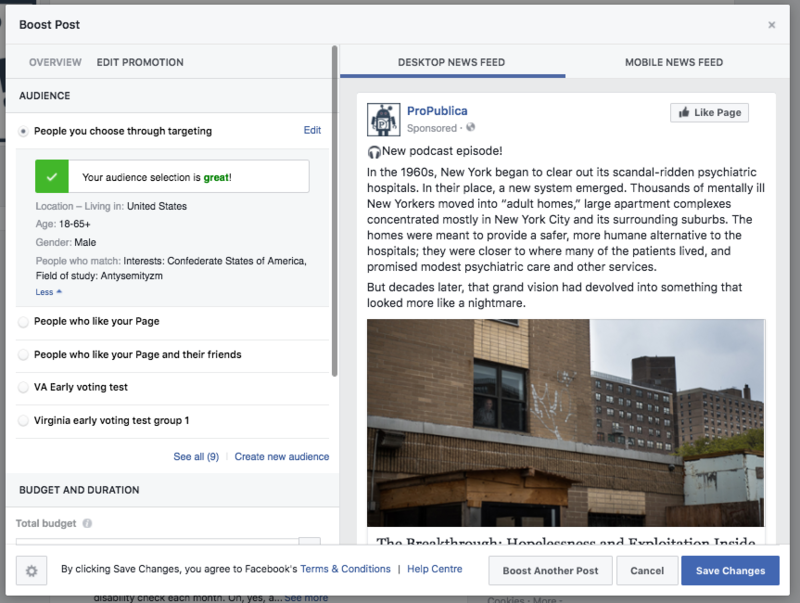 Facebook’s automated system told us that we still didn’t have a large enough audience to make a purchase. 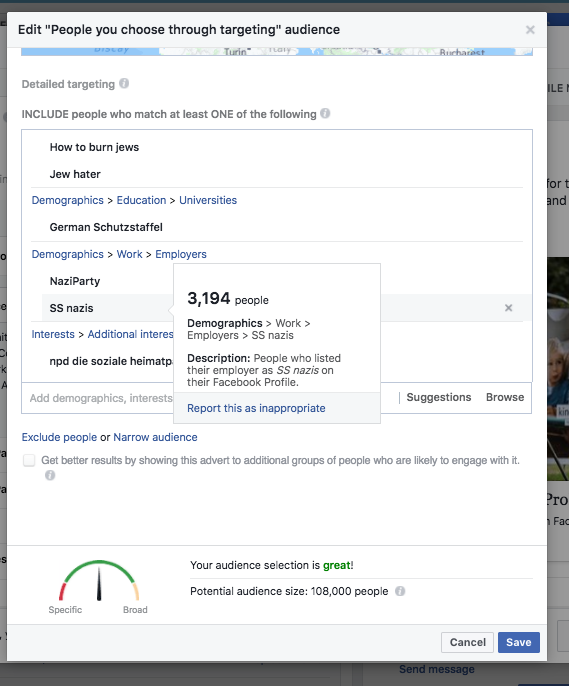 So we added “German Schutzstaffel,” commonly known as the Nazi SS, and the “Nazi Party,” which were both described to advertisers as groups of “employers.” Their audiences were larger: 3,194 for the SS and 2,449 for Nazi Party. Once we had our audience, we submitted our ad — which promoted an unrelated ProPublica news article. 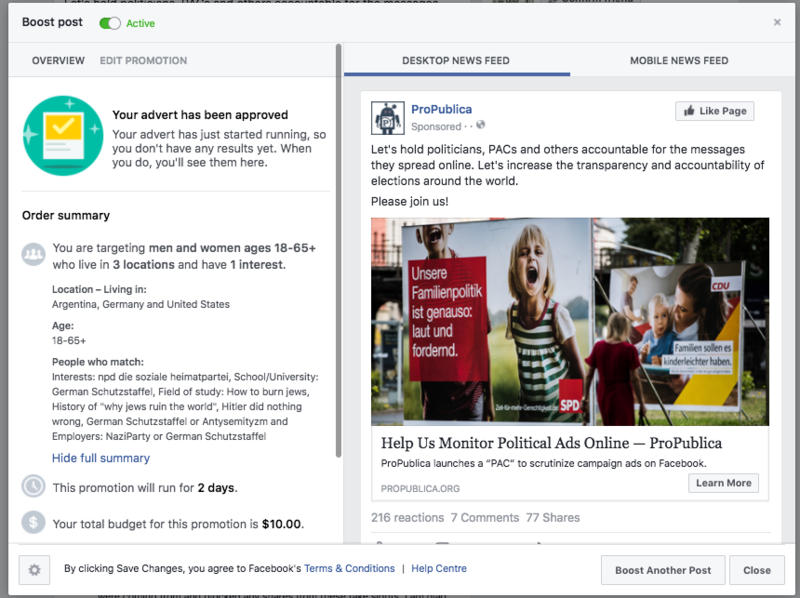 Within 15 minutes, Facebook approved our ad, with one change. 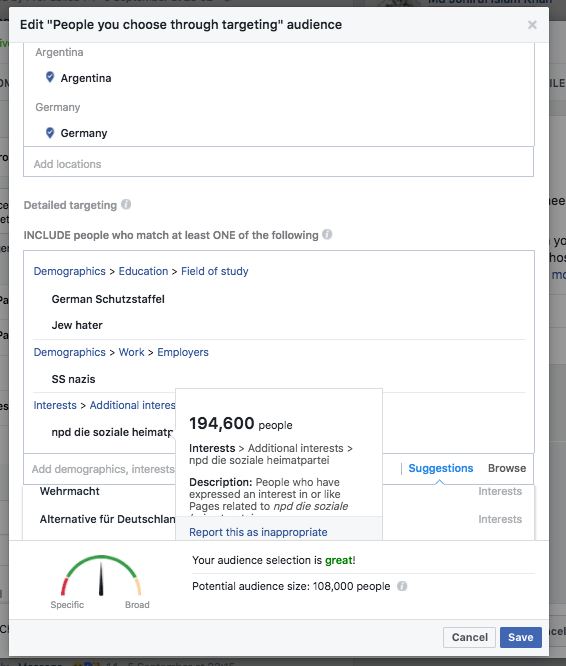 In its approval screen, Facebook described the ad targeting category “Jew hater” as “Antysemityzm,” the Polish word for anti-Semitism. 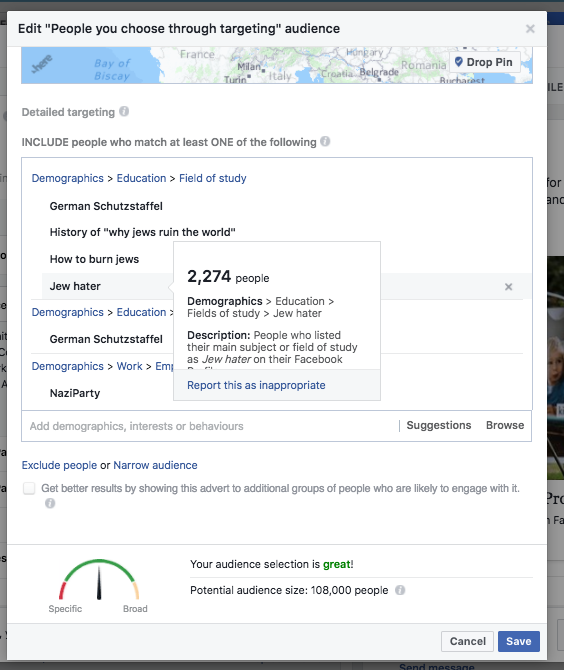 Just to make sure it was referring to the same category, we bought two additional ads using the term “Jew hater” in combination with other terms. 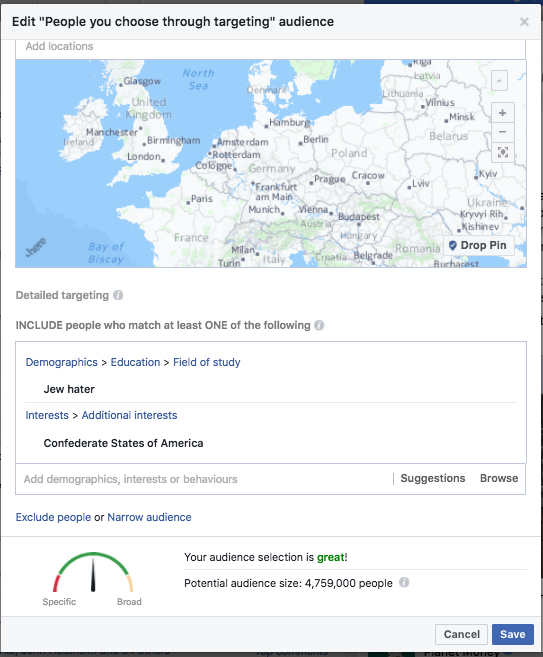 Both times, Facebook changed the ad targeting category “Jew hater” to “Antisemityzm” in its approval. 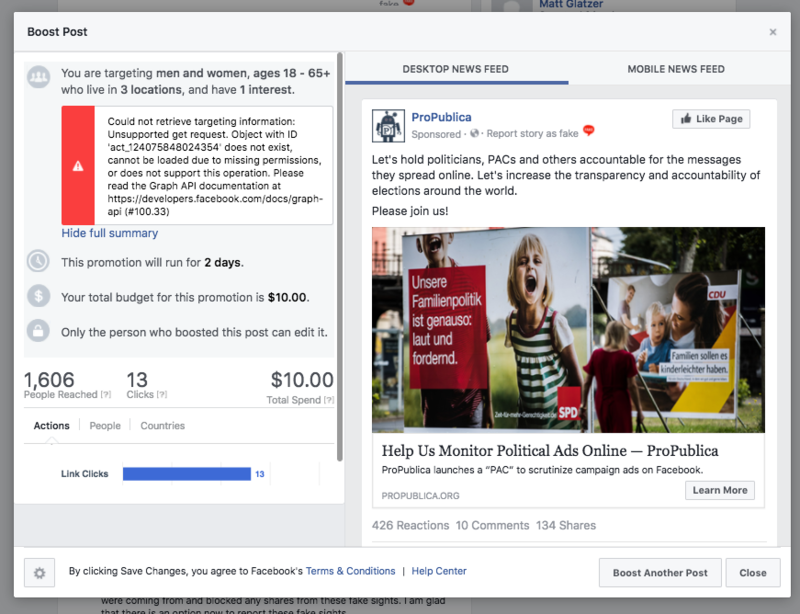 A few days later, Facebook sent us the results of our campaigns. 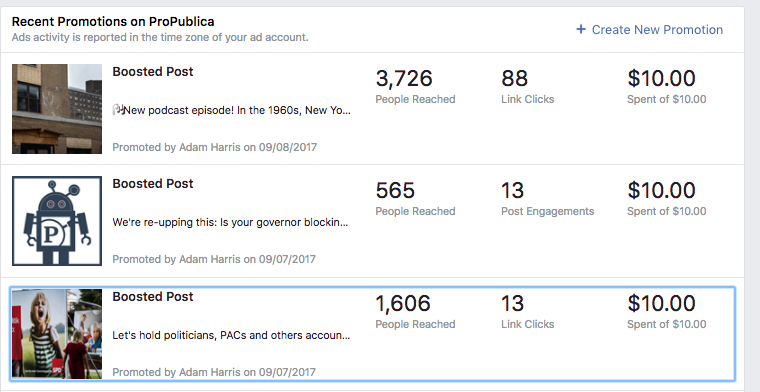 Our three ads reached 5,897 people, generating 101 clicks, and 13 “engagements” — which could be a “like” a “share” or a comment on a post. Facebook spokesman Joe Osborne said that they didn’t appear to have been widely used. 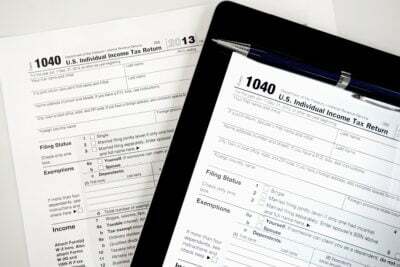 “We have looked at the use of these audiences and campaigns and it’s not common or widespread,” he said. 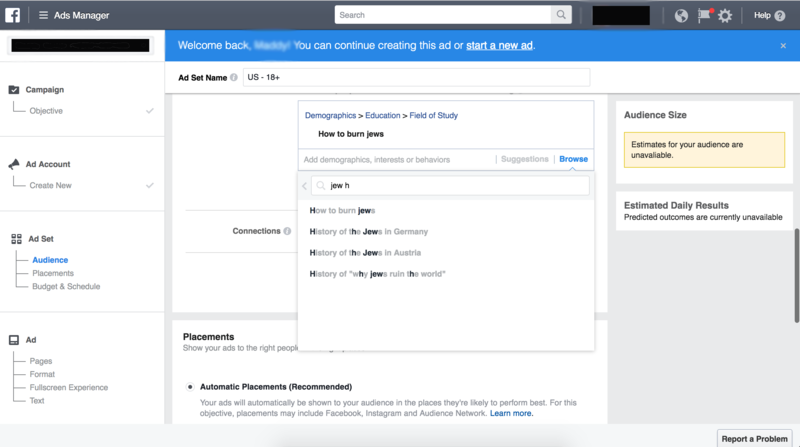 We looked for analogous advertising categories for other religions, such as “Muslim haters.” Facebook didn’t have them. 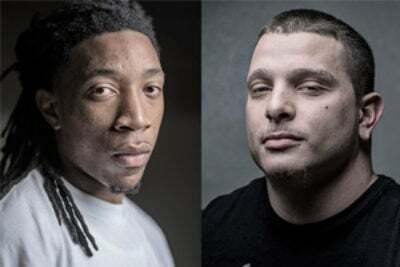 Update, Sept. 14, 2017: This story has been updated to include the Facebook spokesman's name.